The U.S. Environmental Protection Agency (EPA) says that for low-rise commercial buildings, the heat gain through the roof is about 50 percent of the heat gain for the entire building. This heat gain can be reduced not only by using more insulation but also by reflecting the sun’s radiation. 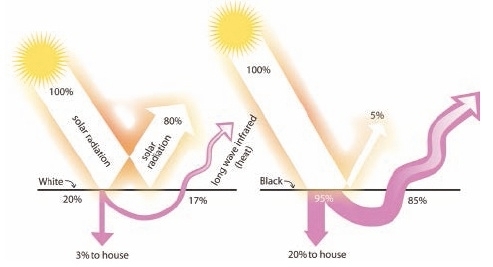 The American Society of Heating, Refrigeration, and Air-conditioning Engineers (ASHRAE) states that the heat gain through a white roof is half of that of a black roof, and the heat gain through a white wall is two-thirds that of a black wall. Thus, in hot cli- mates, the walls should have a light color and the roof should be white. Solar reflectivity, which is also known by the term “albedo,” is a number that indicates how much of the solar radiation is reflected from a surface. An albedo of 0 indicates that no sunlight is reflected or that all sunlight is absorbed, while an albedo of 1 indicates that all sunlight is reflected. The color white has the highest solar reflectivity with an albedo of about 0.9 (90 percent is reflected) if it is fresh, clean, and glossy. Clearly then, the most sustainable buildings would have white roofs and appropriately utilize the colors with an awareness of these aspects. When it comes to solar-responsive design, choosing white can be the easiest and biggest bang for your buck. Selecting white design elements can save a lot of energy, resulting in saving money and being more efficient and comfortable. White roofs dramatically reduce overheating in both buildings and cities. A white roof will reflect much of the sun’s energy, while a dark roof absorbs most of the sunlight and turns it into heat. A dark roof can get more than 60°F (33°C) hotter than a white roof, significantly heating both the building and the outdoor air. As a result, buildings get heated twice by their dark roofs — once directly through the roofs, and secondly by the increased air temperature of the neighborhood. Cities can be as much as 16°F (9°C) warmer than the surrounding rural areas due to the extra absorption of dark roofs and pavements and the lack of trees. This “heat island effect” also increases pollution levels in cities. White buildings can also reduce the energy required for lighting a building. White ceilings and interior walls make electric lighting more efficient, and white roofs and exterior walls can make daylighting more efficient in urban areas. Because daylight enters windows from the sky, most of the light ends up illuminating only the indoor spaces near the windows. On the other hand, much of the light reflected from white walls and the roofs of lower buildings enters windows from below, thereby illuminating the ceiling, which generates better lighting and also sends it farther indoors. White exterior walls also improve nighttime lighting by reflecting, rather than absorbing, street and area lighting. The heat gain through white roofs is 50 percent less than through very dark roofs, and the heat gain through white walls is about 35 percent less than through very dark walls. As a result, the use of white not only reduces the amount of energy required to cool buildings, it also reduces the peak electrical load, which occurs in most of the United States on hot, sunny afternoons. Even buildings without air conditioning benefit greatly, because a white roof will result in a ceiling temperature about 3°F (1.7°C) cooler. That’s equivalent to reducing the indoor temperature about 5°F (2.8°C). Shouldn’t roofs be very dark in cold climates to collect solar radiation? The answer is definitely no in any cold climate that experiences overheating in the summer. Thus, white roofs are best in almost all parts of the United States, southern Canada and most of the world. The reason is the asymmetry of solar geometry. For example, at 40° northern latitude, the sun heats a roof for about 15 hours on June 21, but only about nine hours on Dec. 21 — the solar heater is on for six fewer hours per day in the winter. Also, the low winter sun lights only half of the roof, while the summer sun lights the whole roof most of the day. Furthermore, the wind usually blows more during winter than summer. Thus, a very dark roof loses most of the heat generated to the cold winter wind. Ironically, white roofs make sense even at higher latitudes, because the daylight hours increase in the summer and decrease in the winter. For example, at 50° northern latitude, there are 16 daylight hours for heating on June 21 and only eight hours on Dec. 21. Thus, white roofs are best in almost all climates. 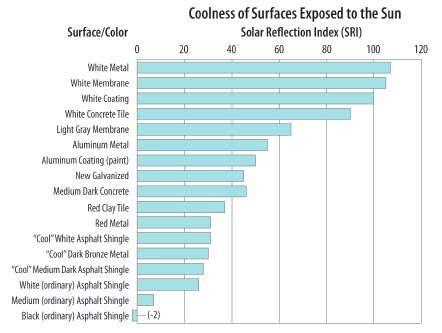 The solar reflection factor, also known as “albedo” is shown in the graph for different surfaces/colors. Keep in mind that the reflectance factor and the absorption factor are two different ways to describe the same phenomenon. Either can tell us how much of the sunlight falling on a surface is absorbed and how much is reflected. Because white has a very high reflectance factor, the absorption factor must be very low, and with a very dark color, it is the reverse. Because all objects simultaneously absorb and emit radiant energy, their equilibrium temperatures (i.e., how hot they get when exposed to the sun) are a result of how much is absorbed compared to how much is emitted. Thus, any object exposed to the sun will simultaneously absorb solar radiation and emit long-wave infrared radiation, which our eyes cannot see but our skin can feel as heat. Consequently, an object’s equilibrium temperature is not only a function of the solar reflectance factor, but also how well it emits heat radiation. The rate at which heat is emitted from an object is a result of both its temperature and its physical ability to emit radiation, which is described by its emittance factor. All colors and surfaces have high emittance except for shiny metal surfaces, which have low emittance. Although shiny metal surfaces reflect most of the solar radiation just as white does, they cannot emit heat radiation as well and, therefore, get much hotter in the sun than do white surfaces. Thus, a white roof will have the lowest equilibrium temperature, a white roof is the coolest roof. Although a very dark color is also a good emitter, it absorbs so much more solar radiation than other colors that it has a very high equilibrium temperature. So why are so many sloped roofs dark colored? A clear and logical reason does not exist. Whatever the reason for dark roofs, most people believe that black is beautiful and white is not (though when confronted with images like the one on this page, they admit that a white roof need not be ugly). Do people in Bermuda have bad taste, because all of their roofs are white? Should we waste money and energy and harm the planet because of widely held opinions in aesthetics? White walls are already popular, and we know of at least one reason for that. Starting with the Renaissance and reinforced by the neo-classical styles after that, white became popular because it was believed that buildings in ancient Greece and Rome were all white. We are now surprised to discover that parts of ancient Greek temples were painted in bright colors. One objection to the use of white walls is that they cause glare. However, the problem is exaggerated. In the Moroccan city of Casablanca (which means “house white”), there is not much glare; eyes are fully capable of adjusting to slight brightness. We can control much of the potential glare of white walls by planting trees and green walls, which should be done anyway, because they are an important part of creating beautiful cool cities. Because of resistance to the use of white or very light colors based on aesthetics, the industry has developed “cool colors,” or “cool coatings.” These high-tech color coatings allow the same dark colors to have higher solar reflectances. This apparent contradiction is possible due to the nature of solar radiation. About 50 percent of solar radiation is visible, about 45 percent is short-wave infrared, and about 5 percent is ultraviolet. The color of a surface is determined only by the visible part of the spectrum (i.e., light). 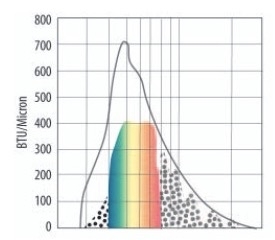 Because the “cool coatings” version of a color reflects more of the non-visible part of the solar spectrum than the ordinary color, the equilibrium temperature is lower. 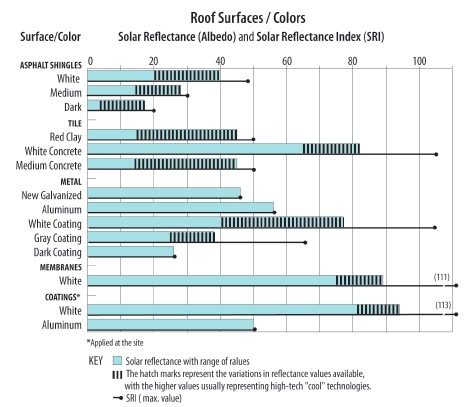 Although the “roof surfaces / colors” graph shows the ‘cool coating’ versions of various dark colors do reflect more solar radiation than the ordinary versions of those colors, these “cool coating” colors still reflect much less than white. Thus, they are not the great remedy we are led to believe. Ironically, it is therefore more expensive to get a mediocre benefit by using a “cool” color than a large benefit from using white or a very light color. Because the coolness of a surface exposed to the sun is a function of both the solar reflectance and the emissivity of the surface, neither of which we can estimate with our eyes, the solar reflectance index (SRI) was developed to incorporate both. The higher the SRI number, the better. An SRI of 100 represents the performance of a clean white surface, while an SRI of 0 represents a clean black surface. A white roof (an SRI near 100) can reduce air-conditioning load as much as 20 percent in one-story buildings. It can reduce both the initial and the operating costs of the air-conditioning system. Adding extra roof insulation in lieu of a white roof is more expensive and is only partially successful, since the dark roof still helps to heat the neighborhood. 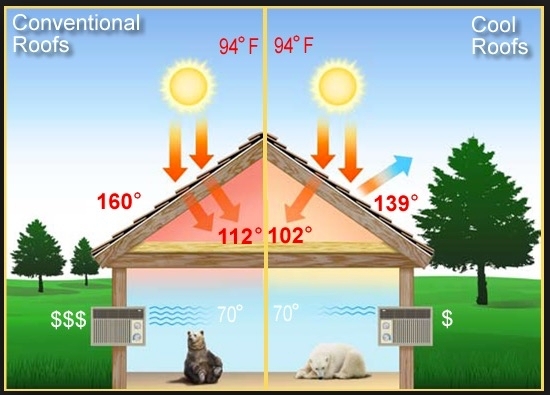 In homes and other small buildings, the air-conditioning ducts are often placed in the attic, where it is common to have 50°F (28°C) air flowing in the ducts and 150°F (83°C) air in the attic. This 100°F (55°C) temperature difference pushes heat through the duct insulation, greatly increasing the air-conditioning load. Because they enable smaller, less-expensive air-conditioning systems, and because it will cost less to cool such buildings, white roofs are a “free lunch that you are paid to eat,” to borrow from Amory Lovins of the Rocky Mountain Institute. You pay less for them initially to save money for the life of the building. The prejudice against light-colored roofs is a case of how our values can hurt us and the planet. This can be compared to the prohibition against solar clothes dryers. Do those who object believe that dirty laundry is hung out for all to see? Most people hang only their freshly cleaned clothing, so what is the problem — could it be faulty values? The preference for darker colors for the roofs over white roofs is another faulty value. Norbert M. Lechner (lechnnm@auburn.edu) is an architect, professor emeritus in the College of Architecture, Design, and Construction at Auburn University, LEED-accredited professional and ASES Fellow. He is an expert in energy-responsive architectural design with an emphasis on solar-responsive design. Lechner’s book, Heating, Cooling, Lighting: Sustainable Design Methods for Architects, is used by more than a third of all architecture schools in the United States and in architecture schools worldwide. The book is also very popular with professionals. He is a sought-after speaker, giving keynote lectures and workshops at universities and conferences around the world. This article is the latest in his series of SOLAR TODAY articles on solar-responsive design. Akbari, H., P. Berdahl, R. Levinson, S. Wiel, W. Miller and A. Desjarlais, 2006, “Cool-Color Roofing Material.” California Energy Commission, PIER Building End-use Energy Efficiency Program. CEC-500-2006- 067: tinyurl.com/29to6s. “Cool Metal Roofing” brochure, Cool Metal Roofing Coalition: http://coolmetalroofing.org. “Reducing Urban Heat Islands: Compendium of Strategies — Cool Roofs,” U.S. Environmental Protection Agency: https://www.epa.gov/heat-islands.